Definition: The sclera of the eye is better known as the "white of the eye." The word sclera comes from the greek word "skleros," which means hard. The plural of sclera is sclerae. The sclera is tough and fibrous, protecting the interior components of the eye from injury, and makes up the exterior coating of the eye. The sclera forms the entire visible white exterior of the eye, the iris is the colored portion of the outside of the eye. 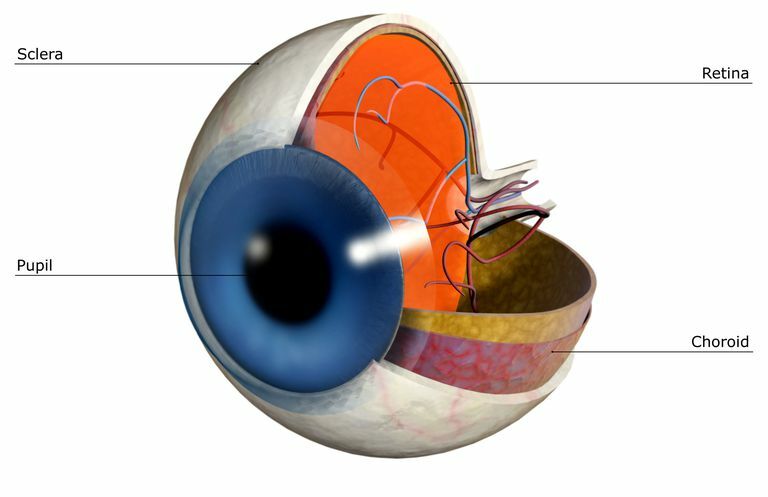 While we can only see the visible portion of the sclera, it actually surrounds the entire eye, and is the fibrous sac contains the inner workings that make vision possible. It also keeps the eye in the rounded shape as the internal contents of the eye are mostly made up of a thick liquid called the vitreous humor. The sclera is composed of four layers. The inside layer is called the endothelium, followed by the stroma, the lamina fusca and the final outside layer is called the episclera. The sclera begins to turn yellow in individuals experiencing liver failure. This condition is called jaundice and indicates that the liver is no longer filtering the blood well. In rare cases the sclera can turn blue. This can be caused by long term use of some medications, a rare condition called osteogenesis imperfecta (brittle bone disease), ingesting silver, and conditions that cause the sclera to be thin which allows the blue color of veins to show through. If you notice a color change in the sclera, you should seek advice from a healthcare professional. Examples: When the patient became jaundiced the sclera of her eye turned yellow along with her skin. Will the Color of Your Baby's Eyes Change? Ever Wonder What Your Corneas Are Made Of? What Color Will My Baby's Eyes Be?